Motherless Alathea Sawneyford, her charms grown disturbing as she rebels against her father, has made the city's streets her own, while Annie Cantabile is constrained, by her own disfigurement and her father, to his pianoforte workshop under the shadow of Tyburn gibbet. One afternoon the dusty workshop receives a visitor. A man, representing an unscrupulous band of City speculators, Alathea's father among them, require a pianoforte and its charming teacher to find titled husbands for all their daughters: sisters Evelina and Marianne; stolid Harriet and pale, pining Georgiana. It seems an innocent enough plan but these are subversive times and perhaps even a drawing-room piano lesson isn't exactly what it seems. All of which will suit Alathea perfectly. 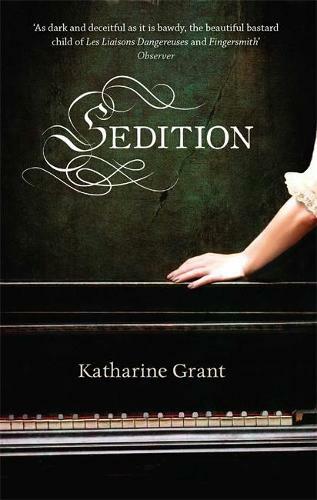 Fierce and bawdy, uproarious and exquisite, Sedition takes its plot at a racing gallop: bold, beautiful and captivating, it is a narrative masterpiece.